Welcome at "World of Paperships"! 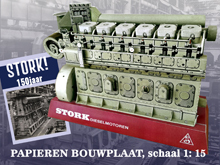 On the occasion that it was 150 years ago that the famous Stork Engine factory, Hengelo, the Netherlands was founded, World of Paperships (in cooperation with Cardboard publisher Scaldis) is offering a special 1: 15 edition of a Stork diesel engine. The mentioned prize is incl. postage costs. 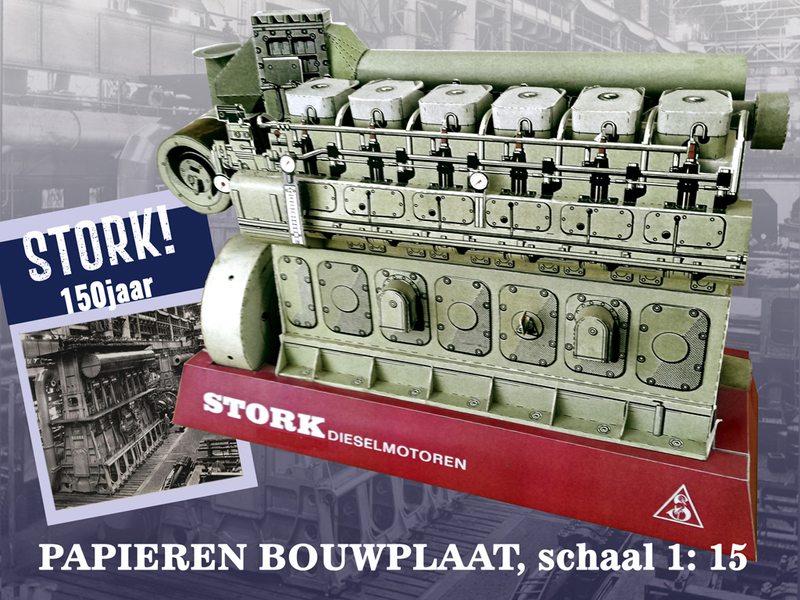 Ter gelegenheid van het feit dat 150 jaar geleden de Stork Machine fabriek in Hengelo (ov) werd opgericht geeft World of Papership, in samenwerking met bouwplaten uitgeverij Scaldis, een speciale reprint uit van een Stork ROH diesel bouwplaat, schaal 1: 15. Wees er vlug bij om deze speciale editie, in beperkte oplage, te bemachtigen. De genoemde prijs is incl. verzendkosten. Since I started World of Paperships, the emphasis of the publications has been on the scale 1: 100. Reason for this is that many starting modelbuilders find smaller scale papermodels such 1: 250 or 1: 400 to delicate to handle. To cater small scale builders, some of my models are also issued at scale 1: 250 and even included into the 1: 100 kits. Examples are e.g. the kits of the Dutch tradional canal barges Spits Ebenhaezer and the Luxe Motor Damsterdiep. However, esp. 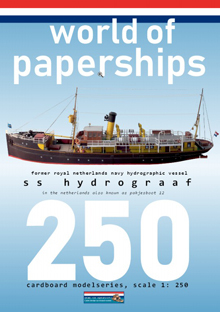 in Germany the scale 1: 250 has more or less become the de-facto standard for paper shipmodels. A good reason to come up with this 1: 250 series! 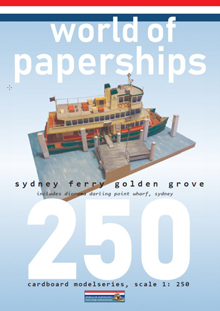 1) Australian Sydney ferry Golden Grove, including a display standard and a ferry landing wharf to create a typical Sydney harbour diorama. 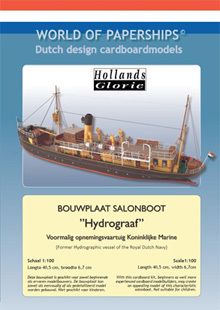 2) ss Hydrograaf, also incl. a display standard..
At the moment I am constructing the third model of the Australian Echuca paddlesteamer heritage fleet, the p.s. Adelaide. This model will be published in both 1: 100 as well as 1: 250 scale. The scale 1: 100 will match the two other paddelesteamers in the 1: 100 series, p.s. Alexander Arbuthnot and p.s. Pevensey. The 1: 250 version will be published in one 250 scale set combined with the Pevensey and the Alexander Arbuthnot. I do hope that the mentioned publications will fulfill the wish of many of esp. my Australian customers. 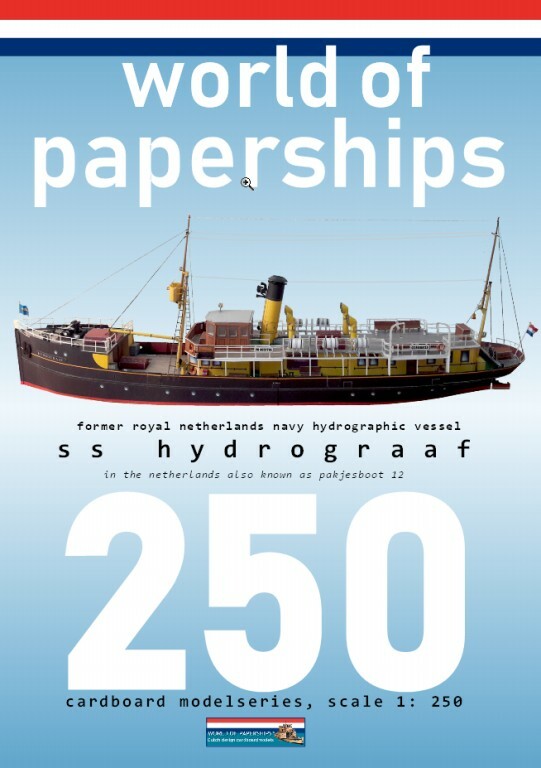 For lovers of Dutch traditional ships at scale 1: 250 a new kit 1: 250 combi kit will be published including the Luxe Motor Damsterdiep and the spits Ebenhaezer. The latter one will also have a number of parts to convert the model in typical Dutch Houseboat as can be found in numerous amounts at the Amsterdam canals. Since a number of months some of my models are also for sale at the Museumshop Het Pakhuys of the Scheepvaartmuseum in Amsterdam. So, whenever you visit this beautiful museum which is a must for every shiplover, do not forget to pop into the shop. Next to these models there are of course many other maritime items for sale which are of interest for you! And don't forget the Museum itself! World of Paperships on Facebook! World of Paperships has now its own Facebook page! Please, like and follow my page and share it with your Facebook modelbuilder friends! 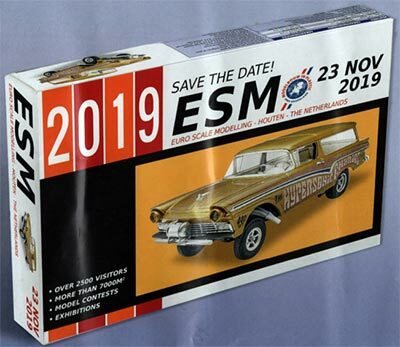 Euro Scale Modelling (ESM), the big IPMS annual event will be held for the second time at the Expo Houten venue near Utrecht, The Netherlands. Plastic and cardboard modellers and clubs of all kind – from historic ships made of wood to radio controlled, from card models to styrene, resin and multimedia or collector models in 1250 scale – will present their models and dioramas. The meeting will be a great platform to make yourself known and to work on your network with shipmodellers with a widest approach to the hobby. 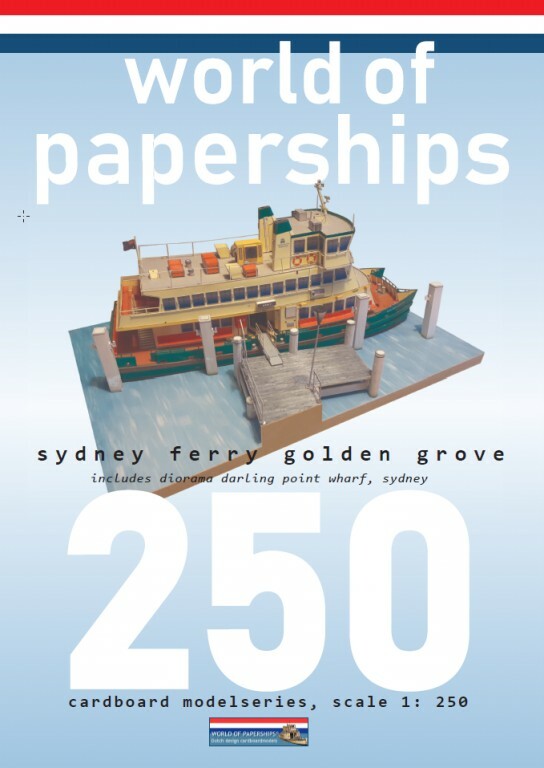 World of Paperships will be there too with all models. Also other cardboard model publishers will be there. 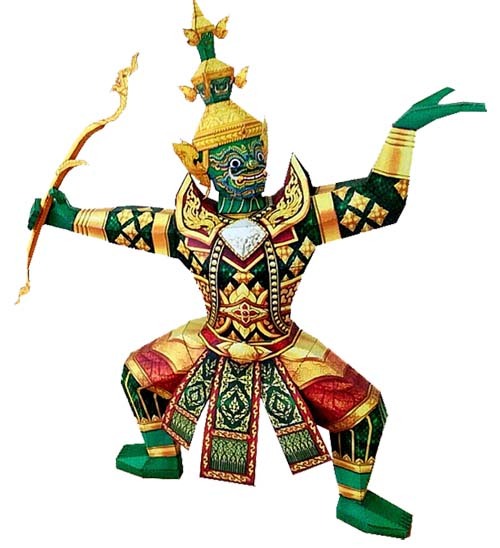 World of Paperships is reseller of a series of unique papermodels of tradional Thai theatre puppets. These models represent Thai Gods which play an important role in many Thai religion based theatre performances. Next to these dolls also paper replicas of so-called "Thai Khon" masks are available and a theatre marionet replica of a French"clown-de-luxe". Have a look at the Paper-puppets page for more information and ordering. On the Downloads page, a free footplate for these puppets can be downloaded. Although it is summer now and Sinterklaas is still celebrating holiday in Spain this is the time to start building your Pakjesboot 12 models or diorama, so you can proudly display it when Sinterklaas arrives in Holland! The model of the ss Hydrograaf is the starting point! You can download for free a set of extra items such as deck boxes, guirlandes etx. to adjust the Hydrograaf into the Pakjesboot 12! 2) Information on WoP's printing policy. Depending upon expected sales, my models are either printed in digital offset printing or by colour inkjet. I do not apply laserjet colour prints due to the risk of the colourpigment breaking off the paper when folded. Let me start with the good news for my foreign customers. In many cases I have applied a discount on the postage costs, for some models up till 5 euro!! The order page mentions two prizes: a prize for orders within the NL and for orders outside the NL. 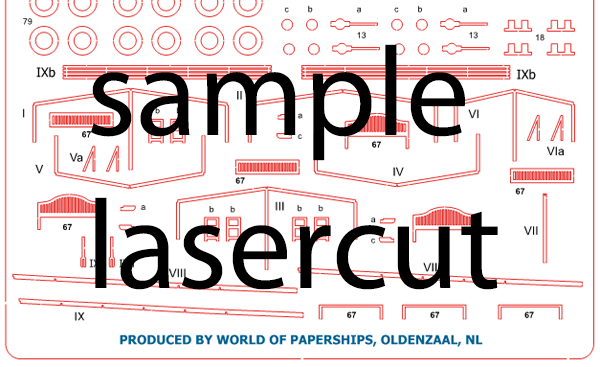 In case you want to order one or more models including a lasercut set, please sent me an email to enable me to sent a combined order to reduce postal costs for you. Important for German customers: Oldenzaal is close to the German border, if possible I can sent larger orders > 35 euro through Deutsche Post to reduce your postage costs! Please email me for such orders, "kein Problem" when you email in German language! I deliver lasercut sets for many of my models. These contain details such as the railings, open side covers of paddlewheel boxes, paddlewheel sides, anchors, seat supports etc. These sets enable also less experienced builders to create models which are hardly recognizable as made of paper! Be aware that the lasercut sets do not replace the cardmodel itself. They are NOT a full pre-cut model! Most of the lasercut sets I am producing myself at a Trotec 300 (Flexx) lasercutter. As the lasercutter is also used by students of the local Technical University, delivery may take sometimes a bit longer due to educational and project constraints. Please accept my apologizes if this applies to your order too.. Anyway, I will always inform you on the expected delivery date. An new page has been added for free downloads that are made available by WoP. They are free cof costs but only meant for personal use! At your wish it is possible to order each model at any other required scale, e.g. 1: 87. Please, ask for infomation on price etc. Please,be aware that custom scaled models will be printed by colour laser printing and as such you have to be a bit more careful by cutting, folding and pasting. Pasting may require some testing with the glue available to you as the colourlaser coating may be sensible to the glue solvents. The General Data Protection Regulation (GGPR) is a European regulation (ie with direct effect) that standardises the rules for the processing of personal data by private companies and public authorities throughout the European Union. GeoComm (World of Paperships) hereby declares that your personal information, made known to me by you, through ordering or other direct contact, such as name, adress, email adress etc. is stored on a protected database and will only be used for order delivery and distribution of the WoP news letter. In case, you do not want your data to be stored for these purposes, just let me know by email and I will remove your data! By no means, any of this information will be shared to others. In case you want to be removed from the database, please contact me by email. WoP was founded in November 2008 by Jeroen van den Worm, Dutch cardboard model-builder, designer and former cartographer /lecturer / consultant. His experience in shipmodel-building includes classic-type wooden sailing ships (of which some are rewarded of being of museum quality) as well as plastic kits and every thinkable kind of cardboard model. This combined with long-standing professional experience in the application of graphic design software, enables him to design models that will appeal to beginners as well as experienced builders. WoP is based in the Dutch small historical city of Oldenzaal, in the eastern part of the Netherlands near the German border. Our products are protected by copyright. Illegal use of any of our products (be it digital and/or in analogue form) will be proscecuted by law. On the occasion of 150 years Stork Engine factory, Hengelo, the Netherlands a 60 years old cardboard model of a Stork diesel engine, type RHO 216 k, 500 pk has been re-issued by World of Paperships and Cardboard Model publisher Scaldis. Scale 1: 15, total 11 sheets, 22,5 x 8 x 16 cm; incl. constructions (Dutch). On all sheets are clear sketches indicated. 250 grams paper, single sided inkjet prints. To be ordered through the (PayPal) order page or using the Shopping menu on the left column. Former Royal Dutch Navy hydrographic vessel / salonboat ss "Hydrograaf". Scale 1:250, length 16,2 cm. 2x 160 grams A4 paper, double sided printed; 2 x 160 gr A4 paper, single sided printed. The kit also includes a display standard. To facilitate construction of the ship it is accompanied by a total of 10 instruction sheets (Dutch and English) and many construction diagrams. 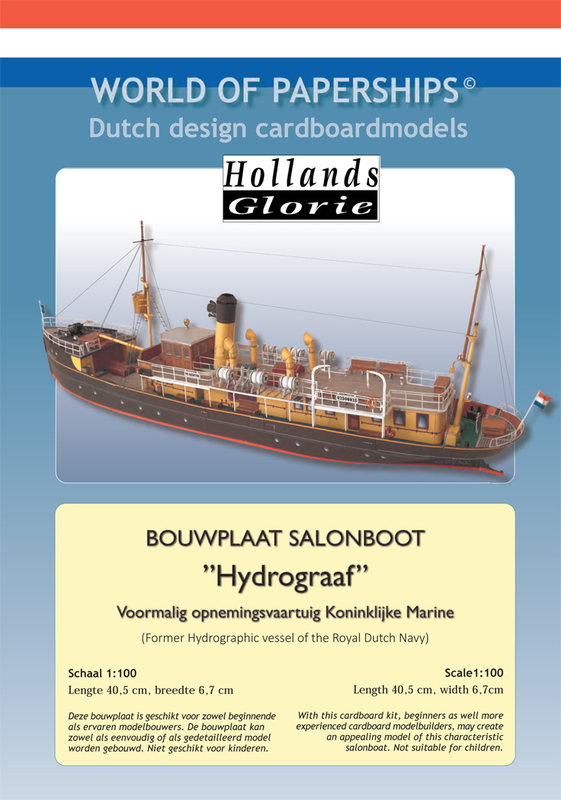 Special for Dutch customers: One time per year, the ss Hydrograaf is used by Sinterklaas and renamed in Pakjesboot 12! A Sinterklaas diorama set can be downloaded as a PDF file for free. Print the pdf file out at 40% for your scale 250 diorama! Scale 1:100, length 12 cm. 4 x 160 gr A4 paper, single sided printed. This kit includes a display standard and a diorama of the Darling Point fery wharf, Sydney. To facilitate construction of the ship it is accompanied by a total of 10 instruction sheets (Dutch and English) and many construction diagrams. Former Royal Dutch Navy hydrograhioc vessel / salonboat ss "Hydrograaf". Scale 1:100, length 40,5 cm. 1x 200 grams A4 sheet double sided printed; 6 x 200 gr A4 single sided printed and two 160 grams A4 sheets single sided printed. Model of Thai God Thotsakan, King of Demons, height 41 cm!